Thermoformed shallow trays are shallow thermoformed containers used for packaging purposes such as carrying, organizing, display, shipping, and storage of consumer as well as industrial goods. Thermoformed shallow trays are made using plastic as well as paper-based laminates with the help of the thermoforming process wherein, a plastic or paper based laminate sheet of particular size is clamped in place, heated to a softening temperature, and forced against a mould with the help of air or vacuum pressure or mechanical means. Thermoformed shallow trays are mainly used in application including food, pharmaceutical, cosmetic and personal care, industrial goods, and electronics. In the past few years, thermoformed shallow trays have emerged as a key packaging solution under the thermoformed packaging product portfolio. The global thermoformed shallow trays market is characterized by market players targeting key market segments by leveraging customization competencies in manufacturing thermoformed shallow trays. Transparency Market Research estimates that the market will continue to expand at a healthy pace in the next few years. Expected to exhibit a CAGR of 5.3% during the forecast period 2016-2024, the market is projected to rise from a valuation of US$4.0 bn in 2016 to US$6.1 bn by 2024. On the basis of type of material used to manufacture thermoformed shallow trays, the global thermoformed shallow trays market has been segmented in the report into plastic and paper-based laminates. Of these, the segment of plastic is presently the most preferred material for manufacturing thermoformed shallow trays and is expected to remain so over the forecast period as well. Thermoformed shallow trays made of plastics are expected to sustain their market preference due to favorable thermoforming attributes of plastic, easy and abundant availability, and low cost. 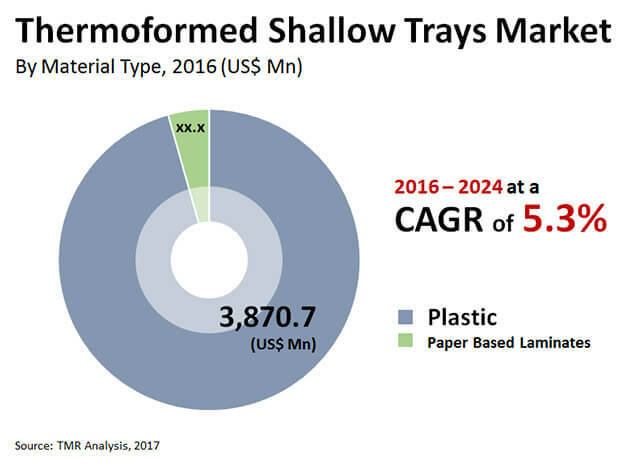 The segment of paper-based thermoformed shallow trays is expected to expand at a below average CAGR of 3.3% over the forecast period. Paper-based thermoformed shallow trays chiefly suffer from their limited scope of end-use applications. The segment accounted for a meagre 4.4% of the overall revenue of the global thermoformed shallow tray market in 2016 and is expected to further suffer a loss in its share in the global market by the end of the forecast period. In terms of geography, the market in North America is presently the dominant contributor of revenue to the global thermoformed shallow trays market. The strong position of North America in the global thermoformed shallow trays market can be attributed to the robust manufacturing capabilities of thin gauge thermoformers in the region. The region is also expected to retain its top spot over the forecast period, exhibiting a CAGR of 5.3%. The market in APAC region is expected to dominate in terms of growth rate in the global thermoformed shallow trays market over the forecast period. The region is expected to attract investments from companies targeting the growth opportunities arising from the thriving retail and foodservice sectors. The market for thermoformed shallow trays in the APAC region is also expected to constitute the second largest share in the global market by the end of the forecast period. The Europe market for thermoformed shallow trays is expected to grow at a CAGR of 4.9% with sales particularly concentrated in Germany and U.K. Spain and Italy markets are expected to witness healthy growth due to presence of considerable number of thermoform packaging manufacturers. Some of the leading companies operating in the global thermoformed shallow trays market are Pactiv LLC, D&W Fine Pack LLC, Anchor Packaging, Inc., Display Pack, Inc., Tray-Pak Corporation, Huhtamaki Oyj, Sonoco Products Company, Bemis Company, Inc., and Placon Corporation. Transparency Market Research examines the Global Thermoformed Shallow Trays market for the forecast period 2016-2024. The primary objective of the report is to identify opportunities in the market and present updates as well as insights pertaining to various segments of the global thermoformed shallow trays market. The report begins with an overview of the global thermoformed shallow trays market, evaluating market performance in terms of revenue, followed by TMR’s analysis of key trends, drivers, and restraints witnessed in the global market. Impact analysis of the key growth drivers and restraints based on the weighted average model is also included in the report. To compute the market size, in-depth secondary research is done. Data points such as regional splits and market split by material type, and application has been assimilated to arrive at appropriate market estimates. The report comprises the forecast of the global revenue generated by the sales of thermoformed shallow trays market. TMR triangulates the data via different analysis based on supply side, demand side as well as the dynamics of thermoformed shallow trays market. Vital feature of this report is the analysis of the thermoformed shallow trays market by region, material type and application type; and the corresponding revenue forecast in terms of absolute dollar opportunity. This is traditionally overlooked while forecasting the market. However, absolute dollar opportunity is critical in assessing the level of opportunity that a provider can look to achieve as well as to identify potential resources from sales perspective of the global thermoformed shallow trays market. To understand key segments in terms of their growth and performance in the thermoformed shallow trays market, Transparency Market Research has developed a market attractiveness index. The resulting index should help providers identify existing market opportunities in the global thermoformed shallow trays market. In the final section of the report, thermoformed shallow trays market competitive landscape is included to provide a dashboard view of companies that manufacture and provide services of thermoformed shallow trays market. The report contains company profiles of some of the players in the global thermoformed shallow trays market. Some of the players operating in the global thermoformed shallow trays market include Pactiv LLC, D&W Fine Pack LLC, Anchor Packaging, Inc., Display Pack, Inc., Tray-Pak Corporation, Huhtamaki Oyj, Sonoco Products Company, Bemis Company, Inc., and Placon Corporation.